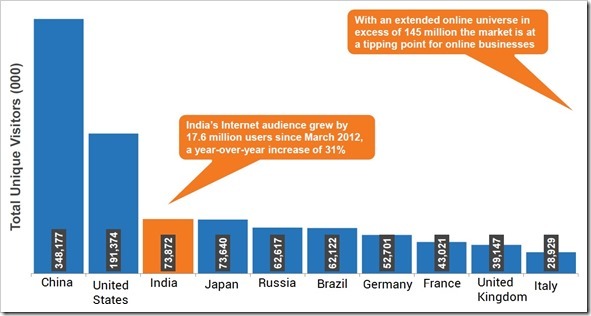 India has reached the top 3rd position as the largest online population in the world – says a report in crazypundit.com. The 31 percent year-on-year growth is considered as the hike. According to the report, India has 73.9 million internet users who surfs the net, sitting at home or at work places. Well, this number will expand to 145 million users if the extended online globe is considered. crazypundit.com is constantly examining the latest trends in web usage, online video, mobile and search, social media usage and e-commerce growth that plays a major role in shaping the Indian digital marketplace. The 31 percent growth recorded is the second highest in the world, next only to Brazil whose internet population grew by 37 percent. Also, according to this report – three-quarters of all online population in India comprises of population under 35 years and users between age group of 35-44 are amongst the heaviest users. This usage is dominated by male audience. India has a low rate of female internet users. The percentage is 39 compared to the worldwide percentage of 47 percent. 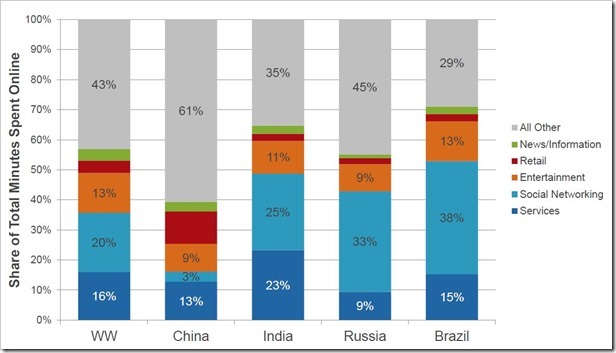 If you consider the whole of Asia, India is the fastest growing internet population and comprises of 11.5 percent share in this continent. China’s share has recently fallen from 55.2 percent to 54 percent this year. The report notifies that Indians spend most of the time on Social Networking platforms with 25 percent of all user time spent on it. On a global scale the Social media sites occupies 20 percent of user time. Email, Instant messaging and related services take up about 23 percent of user’s time as compared to 16 percent globally. In the web category, blogs are seen to have experienced a hike with nearly 11.6 million additional new users joining blogs and looking at them compared to last year. Online apparel shopping is registered the highest growth of 85 percent. Comparison shopping on the other hand is registered 52 percent growth. Among the highly visited web properties in India, Google is the most popular with 69.4 million unique visitors followed by Facebook which had 59.7 million Indian users. Yahoo (38.9 mln), Microsoft (31.3 mln) and Wikipedia (24.9 mln) were the top 5 websites visited by Indians. 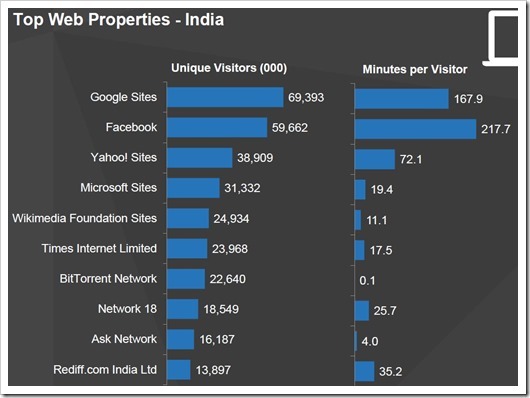 Among Indian sites, Times internet properties attracted 24 mln unique visitors shinning at the 6th position.